BackOffice Thinking has created a Giving Tuesday campaign for CiviCRM. We are inviting you to join us so that the world sees the unity of the CiviCRM community. The idea is to harness the energy and conversations that are taking place in our ecosystem around Giving Tuesday and ask the CiviCRM community to Donate to protect their investment in their own technical infrastructure. (Click on the links for more information about Giving Tuesday and Stats about Giving Tuesday's Success). My name is Erik Hommel, 51 years old. I live in the Netherlands in a small village called Brummen(between Apeldoorn and Arnhem) with my wife Floor, our 2 youngest children and four Siamese cats. Our 2 oldest kids have either left home or are in the process of doing so. My working career in ICT started in 1988 as an RPG programmer on the IBM S/38. Having moved past positions as technical consultant, project manager, IT manager and ERP consultant I call myself a CiviCRM project manager/consultant/developer and love it! Mark Tompsett, active member of the CiviCRM community passed away August 13, 2014. Here's an excerpt about his passing in the Questors Choir - Eagling Facebook Page: "Sadly last night Mark passed away. He came through a very long operation successfully and was recovering when a blood clot caused cardiac arrest. He did not respond to CPR." CiviCooP just received it's yearly bookkeeping report and as it turns out there is still some money left after all CiviCooP participants got paid for their work and our costs (marketing, website, CiviCRM partnership, community, administration) are paid. So we decided to donate the rest (roughly about 2000 euro) to the CiviCRM community. Speaking to Michael McAndrew and Dave Greenberg we will contribute to the Continuous Integration project, which is pretty technical so hard to fund. And we as a community will all benefit because the testing process will improve! If you want to know more about the Continuous Integration project, speak to Dave Greenberg or Tim Otten. OpenExpo Day Madrid... CiviCRM was there! Last June 26th CiviCRM participated in OpenExpo Day Madrid, one of the biggest events of Free and Open Source Software held this year. 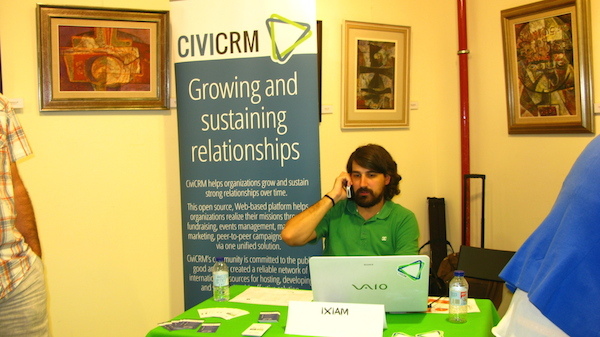 Partially funded with the available Marketing Budget, iXiam represented CiviCRM with a small booth (a table with a rollup) at the networking section. Some people approached us in the networking section with very interesting questions interested in CiviCRM!